BeaderJoJo is a Connecticut beadweaver with extrordinary imagination. Her Etsy shop, Unique You, is filled with delightfully original designs like 3D Floating Tetris necklaces and colorful Dreadlock beads and sleeves. BeaderJoJo uses the highest quality materials to create her designs. Delica and Toho seed beads are woven into intricate designs using PowerPro braided fishing line so that the creations are strong and water resistant as well as beautiful. BeaderJoJo is a fellow member of the Starving Artists Team on Etsy. She also belongs to the Etsy Beadweavers Street Team. 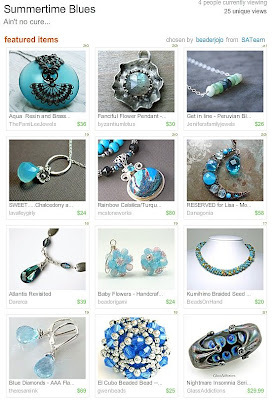 BeaderJoJo was kind enough to feature Bonnie's Aqua and Brass Resin necklace in her recent treasury Summertime Blues. Thank you for including us in such a lovely collection.